"The first dead body I ever saw was my own." For twenty-five-year-old Tyler Morgan, being murdered was easy. Easy in comparison with working for the Grim Reaper. Only … the lost reaper isn’t actually lost. He has a new body and a new life and no intention of turning himself in, even if it means giving Tyler her life back. Tyler begins the grisly task of reaping the souls of Easton’s dead while searching for the reaper. He could be anyone – the intriguing detective, Sam Lockwood; the handsome, wealthy Chris Bradbury; or the serial killer stalking the women of Easton. Women who bear an uncanny resemblance to Tyler. But what is the ancient secret, hidden from mankind, that has motivated Grimm to chose Tyler for the morbid task? Absolutely loved this book. Enjoyed every page and found it hard to put down, with twists and turns it kept me guessing. Can't wait to read the next one. I loved this book. Please hurry up with book two so I can find out what happens next. I really liked the characters of Tyler and Sam and the sense of mystery drew me in and made me keen to find out what would happen next. 5.0 out of 5 starsReapers Beware! I loved this. Lost Reaper (Ms Nolan’s debut novel) is a paranormal romance / mystery that will keep you guessing whether it’s figuring out the murderer’s identity, the heroine’s connections to the men in her life or the real reason the Grim Reaper chose to give Tyler ‘a second chance’ at life. Heartbreak abounds in this story, but along with it comes a fierce determination for Tyler to succeed and save not only her soul, but also the lives of those around her. Tyler evolves into a woman of strength and conviction as the story unfolds, yet the writer allows the reader to see the heroine’s doubts and vulnerabilities. I cheered for her, I became teary in parts, and I rallied in her ability to rebuild herself each time fate dealt her an unfair hand. Then there’s the climatic ending, which is where I may have uttered a swear word or two because now I have to wait for the second book to know what happens next for the surviving characters. Stalking authors for release dates is a thing, right? This book will grip you right from the start and simply not let go. Powerful writing, intriguing characters and a storyline that is packed with mystery, drama and action ensure that the reader is not left disappointed. Can’t wait to see how this story develops in the next book. 5.0 out of 5 starsWhat would you do if Grimm grabbed hold of you? This book draws you in from the very first page. Nolan's tense and compulsive storyline of Tyler's fight to regain normalcy after being murdered and appointed a Reaper (and also discovering her flatmate in bed with her boyfriend) is compelling and filled with angst. Poor Tyler faces so much but she is able to courageously manoeuvre through the mire and find her strength - and place. There's definitely a sequel headed our way and I'm waiting to find out what happens next! I loved this story. 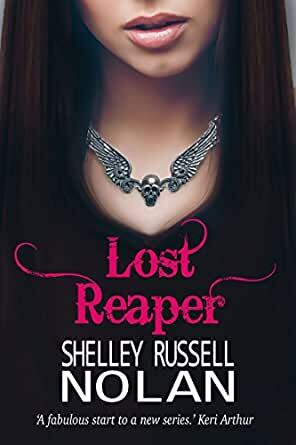 I won't give away major plot points, but it is about a young woman who is given a chance to be a Reaper. She reaps a bunch of female souls who have been murdered. Shelley managed to keep you guessing about the killer's identity until the final pages, along with how the heroine was connected to all of it. The pace was tight and suspenseful, making me turn the page and wanting to know what happened next. Also thought the love triangle was written well (I prefer Sam!). My only complaint about this book is that I read it too fast! I really enjoyed this book. Great story, great characters, great suspense, a great 'who done it' that keeps you guessing until then end. I can't wait to read the next instalment!